When asked to create an illustration for SAPO.pt Christmas logo, the first thing that came to my mind was Mike Ploog’s book, “The life and adventures of Santa Claus” and old Disney animation TV specials. That “classical” feeling, the golden hues evoking warmth and Christmas as a fantasy universe, made a big impression on me as a kid. So I decided to try something inspired by these works. To start I sketched, researched and made some color studies. First rough layout. Originally Mrs. Claus was by Santa Claus side, but in smaller sizes she wouldn’t be perceptible. Researching traditional Lapland, Nordic clothing and construction. Also studied gifts and their wrappings. All those helped the scene come to life. Creating a SAPO elf, based on the research. Perspective for the Background . Color study in Procreate, a iPad app for digital drawing and painting. Next, the foundations for Santa’s house. I wanted to use a method similar to an animation workflow, to get a classic look. To do this I made the background independent from the characters and used a lightbox to put it all together. Used Sketchup to make sure prespective and staging were correct. Using the 3D image as reference I roughed out the scene. 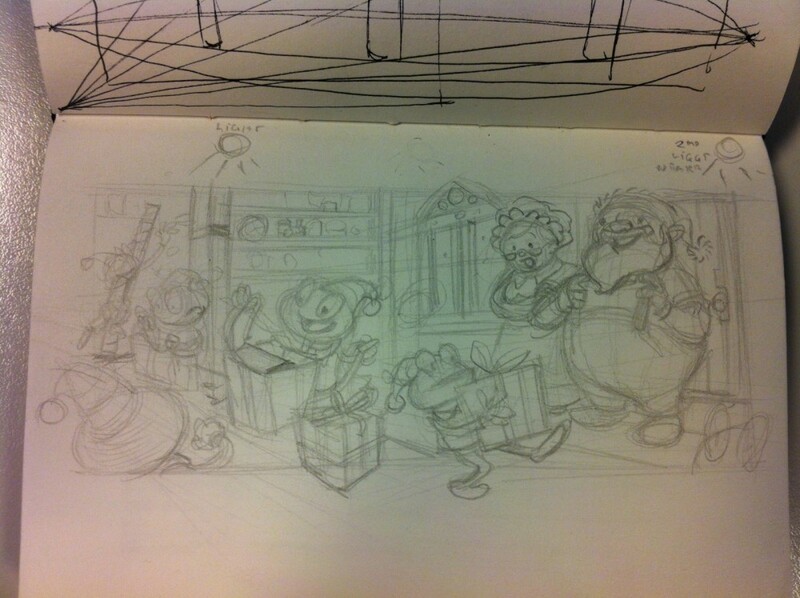 Used a lightbox to draw and position the characters on the background..
Clean pencils for characters and the room. 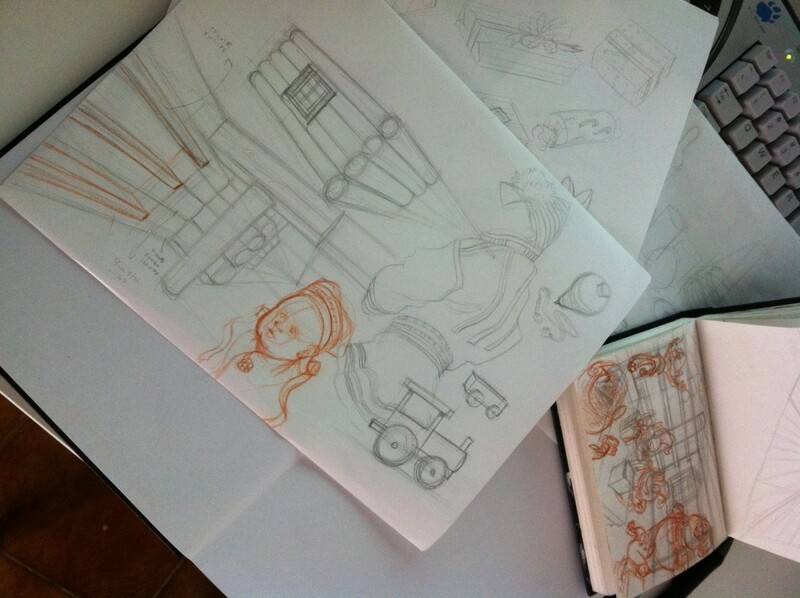 Then scanned all the drawings and it was time to paint in Photoshop. After adding some line work to the color, the image is ready. Below you can see the final image, with some changes to increase readability for smaller sizes. 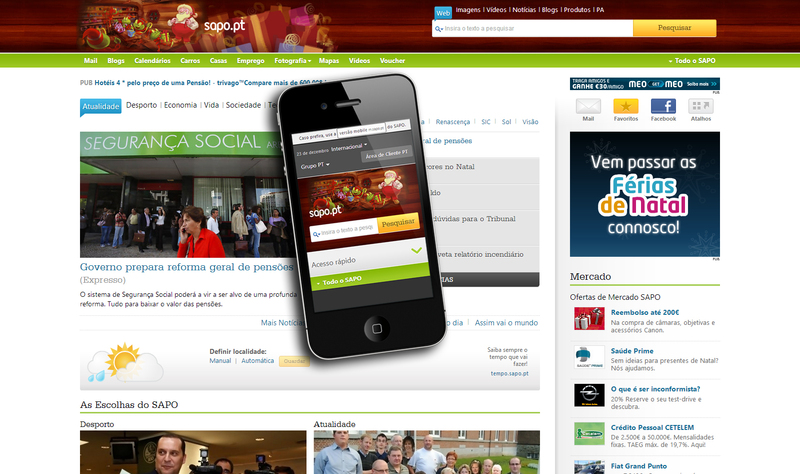 It was used on the desktop and mobile version of SAPO homepage.